The King Canopy Festival White Instant Canopy measures 10 ft. x 15 ft. and features a sturdy straight leg design with center truss. The powder coated steel frame is ultra strong and come with easy - to - use twist buttons to adjust the height of the tent and release the fittings. This set comes with the guy ropes and ground stakes, heavy duty roller bag, and a fire retardant 420 Denier white polyester top with PU coating that resists mildew, flames, and water. Are sidewalls available? How about screened walls? I'm interested in using this for camping. Most of the time, I would want air flow, but if it rains I would like a canvas wall. For this particular size, you will need to contact the manufacturer, King Canopy directly. We just bought two white canopies, 15' x 10', and the wind hit them and broke many of the connectors. Is there any way to replace these with new parts (such as new connectors for the joints)? Or, can I get new frames only? We only used them for a week. Please contact the manufacturer King Canopy directly for availability as we only carry the full unit. The photograph online shows the tent as having 2 peaks, however, the detail drawing of the tent shows only a single peak pole. Which is the correct representation of this canopy? The King Canopy 15' x 10' Festival Straight Leg Instant Canopy will have two peaks as it does in the picture on our site. Thank you for your inquiry. The King Canopy 15 Foot x 10 Foot Festival Straight Leg Instant Canopy has roughly 7 foot for the side height from the ground to the bottom edge of the fabric, the overall height is 11 feet. Do you have a sidewall kit for this tent? This canopy does not have an optional sidewall kit. Can you get the 10x15 tents in school colors and or logos? Is there a tag on the tent canopy itself stating the flame certification ( NFPA-701)? This canopy includes certification for the CPAI-84 standards, which supersede the NFPA-701 standards. This is acceptable in most areas. This canopy does not include certification for the NFPA-701 standards. I need a quote on this tent and also one for your 10 x 10 (Undercover Part Number: UC-3P10W eCanopy Item Number: UCC-UC-3P10W). I need the canopy in red with Cold Stone Creamery logo on all four sides. Is this possible? How much does this King Canopy 15 x 10 foot festival straight leg instant canopy weigh? Thank you for your inquiry. The weight for the King Canopy 15x10 canopy is 75lbs. The tent when packed can be rolled around in its carrier and handled by one person. I would advise on dis-assembly and that you repackage the canopy portion in it's own plastic bag and return the frame to the bag it arrived in. I am guessing 40 to 50 pounds. I set it up myself. I don't know exactly how much it weighs, but it is pretty heavy. When folded, it was comfortable for two men to carry it even though one could do it. My guess is it weighs 60 or 70 lbs., but it seems like somewhere in the product specs or with shipping it would say how much it weighs. This canopy in the bag with all parts weighs 80 lbs. The Shipping Weight posted on the UPS label was 81lbs. I don't think it's that heavy, but it is heavy. Does this King Canopy Festival canopy meet the fire safety regulations required in Canada? This canopy meets CPAI-84 Section 6 specifications. You will want to speak with local code enforcement to see if this is an acceptable rating for your area. Does this King Canopy festival canopy come with side walls? This canopy does not come with sidewalls. How many height adjustments are there on the legs of this King Canopy straight leg canopy? Also, what exactly is a "Pull-Pin"? This canopy has three height settings. The pull pin is a pin on the leg that snaps into place when you reach a certain height. In order to adjust it, you will pull it out and either pull the leg up or lower it to reach your desired height. Is this King Canopy straight leg canopy waterproof? This canopy is water-resistant, but not completely water proof. The King Canopy 15 Foot x 10 Foot Festival Straight Leg Instant Canopy weighs 83lbs. I am responsible for purchasing tables, chairs, and a canopy for an outdoor garden at a small high school in California. Would this canopy be appropriate for a school setting? The canopy you linked to would indeed be appropriate for a school setting. The only other thing you need to consider is how many people will need to be accommodated under the canopy. This canopy offers 150 square feet of shade. If you decide you need a little more space, we also carry several 10 x 20 canopies that offer 200 square feet of shade. Comparing this Canopy and the ShelterLogic 10 x 15 Pro Series Pop Up Canopy, What are the differences? Which one is better? The King Canopy 15 x 10 Festival is a little more heavy duty, weighing approximately 83 pounds versus the 10 x 15 ShelterLogic Pro Series canopy. There is also a difference in the flame retardant ratings. The King Canopy unit is both CPAI-84 Flame Certified and NFPA-701 Flame Certified. The ShelterLogic unit has only the CPAI-84 Flame Certification. What is the size of the closed canopy in the bag? How long are the guy ropes (I have screw in anchors from a previous canopy)? This unit ships collapsed in the storage bag with dimensions of approx 65 x 13 x 10. The guy ropes included with the canopy measure 10'. Is the canopy vented to relieve wind pressure? Do most 10 x 15 brands you offer also have vented canopies? The only tent we do carry that features a vented style, is the Quik Shade 10x10. Please let us know if you have any further questions. How will this hold up in light rains? Is it water proof or water resistant? This shelter will do just fine in a light rain. The canopy top is water resistant but not water proof. So, rain will bead up and roll right off the top. However, should water begin to accumulate on the top, you would risk both damage to the canopy and leaks. What the difference is between this model and the Explorer by King Canopy? The Explorer by King Canopy is a lighter weight version of the Festival. The top is only 250 denier and the head clearance is slightly lower, maxing out at 6'9". By comparison the Festival has a 420 denier cover and a 7'2" clearance. The festival also has easier to use twist knobs for adjusting the frame height. We are looking for a very durable, easy to assemble canopy for our cross country team. It will need to be set up and broken down repeatedly; enclosure sides would be helpful, and it should withstand reasonably high winds since most of our use would be in the fall during windy, inclement weather. How durable is this canopy? Are there others that are more durable? Are there any with warranties? 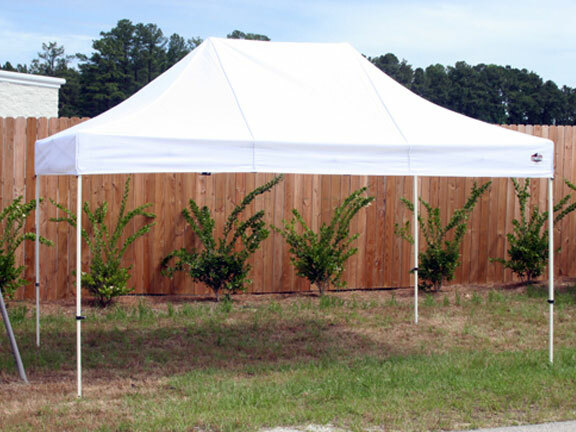 This shade canopy is very easy to assemble and is intended to be set up and taken down regularly. You may find the enclosure walls on the accessories tab on this item page. This tent will come with ropes and stakes, though it is not wind rated. For additional stability, you may wish to purchase the weigh bags which are also found on the accessories tab. This item carries a 1-year manufacturer's warranty against defects in manufacturing. Weather related damage is not covered under warranty. What is the weight of this tent in the bag? After having our canopy up for just a few days, one of the posts went right through the cover. When we took it down we saw that it was not sewn properly. In looking at the stitching where the other post meets the cover, it was not stitched properly either and would have torn also. Got a GREAT DEAL for $160. Use these tent canopy for farmers market. I purchased the canopy to fit on the back of one of my decks for party purposes. It went up pretty easily the first time (needed two people), it took about 15-20 minutes. I fastened it to my wooden deck via short wood screws at the corners and used (8) bungee cords (4 ft long to anchor the back sides and corners to my deck's hand rails. I left it up for two days (no problems) and took it down myself (15-20 minutes) and packed it away. Construction looks good and it is very easy to adjust.. Also the 7' 2" height is just right for the deck. ConsI believe aluminum feet on the four support poles would be better, than the plastic ones supplied. Screws wanted to pull through the plastic corner feet. The quality of the king canopy 15x10 is average and needs a lot of weight to support in the wind. Quick and easy to setup. Shipping was amazingly fast. ConsNeeds a little weight when used in high winds. I realize people use these canopies for all kinds of purposes, like a car port or for weddings and receptions and stuff like that. I used it as a temporary shelter while I was working on redoing some stuff in my house?a rebuilding project. So I kept my tools, sawhorses, and so on outside under the canopy. My needs and expectations were pretty low, actually, but this product exceeded them in every way. Even though they recommend you have more than one person assemble it, I did it without help in fifteen or thirty minutes. And of course once you?ve set it up once, you can do it faster after that. I like the big size of this canopy. It allowed me to keep all my materials underneath and keep them dry, and it allowed me to work in some shade rather than out under the sun. The bright white color is very appealing. Here?s another unexpected perk of this product?the storage case has rollers on it, which makes it nice when you have to store the canopy. It folds up pretty small, and it can fit in the corner of the garage or in a small storage space in your home. A few tips?you can adjust the legs so if the ground you have it on slopes, the canopy can still stand straight. You need to be sure you weight it down properly, or it can blow away. Anyway, I was ?blown away? by this purchase. I think you?ll really like it too. I found that one person can pretty easily assemble this if the ground is smooth, but if it?s rough or uneven you?ll probably want a helper. I?m very happy with the quality of the tent. We used this at a reunion, and it was so nice to be able to escape the sun by sitting under it. Because the color is so light, it reflects the heat rather than absorbing it. I?ll just add that when I got it the delivery guy had apparently dropped it at some point, and I didn?t realize that until later. Then when I unpacked it the first time I saw that a piece was broken. I ordered another piece and had to fix it myself. Not really a big deal, and it?s all okay now. I?d just advise you to check out the product as soon as it arrives rather than waiting a while. I really like this product! I was able to assemble this tent without help, which is a big plus, even though it weighs a lot. A zipper on the storage unit was unusable. It was that way when I got it, so I decided to just live with it. This tent weighs a lot but if you have three or more people assembling it, you can do it. Really pleased with the quality. This really wasn't the manufacturer's fault, but when the package arrived it had been damaged in shipment. I had to order a piece to replace the one that was broken and install it after it arrived. So that was OK, and, like I say, it wasn't the manufacturer's fault. We use it for family gatherings, and it's really very nice. We used this to cover our merchandise at the county fair. It worked great, and people told us how nice it looked. Even when the weather got wet, it stood firm. Note that it weighs a lot and can?t be set up by just one person. I assembled this unit without help in less than thirty minutes. I used it outside as a temporary shelter while I was doing remodeling work on my house, and it really worked well for me. It kept both the sun and rain off?of me so I could continue to work, which I couldn't have done if my tools, etc., were just sitting out exposed to the elements. I really like the size of the canopy as well as its bright white color. The materials used to make it are really good--it's sturdy and well constructed. Just be sure you've planned ahead to have a way to secure it to the ground. I suggest setting it up with the legs in empty plastic 5-gallon paint cans or something similar to that. Then fill the cans with sand. Just don't trip over them when you're walking around! You may have to practice a few times to get the canopy back into its storage bag, but it will fit once you get the hang of it. I like the fact that the storage bag is on rollers. I'm very happy with this purchase. Based on my experience, I?d say that if you?re looking for temporary shelter that stands up well in thunderstorms but requires more than three people to assemble, this product is for you. We had this set up for our kids to enjoy, and it worked very well until it rained. I should have known better, but the rain pooled on the roof and eventually broke it down. It couldn't be set up again after that. But we liked it so much we ordered another just like it. I sell clothes at flea markets, and I use this canopy to show off the merchandise. It?s not designed for that use specifically, I know, but it works great for that purpose. Sometimes people even tell me they?d like one like it and wonder where I bought it. Assembly is quick and easy. The only possibly negative thing is that someone who?s tall might have to slouch a little to avoid hitting his head on the center supports. I also bought side walls for my canopy to keep my stuff covered at night. Great product. I was a little nervous about this before it arrived?whether it would look right and work on our cement slab when we had people over. But I?ve been very happy with it now that it?s here. Easy to put up, as long as you have someone to help you. The construction seems to be top-notch. I?m thinking about ordering a second one just like it. Sorry, not happy with this product. I wasn?t able to unpack it until I?d had it more than a month, so I couldn?t send it back. When I unpacked it I was really disappointed with the quality. I?m very glad I bought this?really pleased with it. Just note that it weighs a lot, and you?ll need help (like, two or three more people) to put it up. I like the fact that it comes with everything you need, including a storage bag and ways to secure it. We use it to display merchandise, and people comment on how nice it looks. You'll need more than one person to set it up, though. This looks so nice on our patio! We've had get-togethers out there, and it's nice to have whether it's daytime or in the evening. Two or three people can assemble and take it down quite easily. We're planning to order a second one! I've had this up three or four times this summer, and it withstood heavy showers more than once, so I'm pleased about that. Note that you can't set it up by yourself. I can tell from reading others? online reviews that they use these tents for a variety of purposes. Well, we used it for a place for the grandkids to play in?kept them out of the house and having fun but also kept them from getting ?too much sun.? They love playing in it. I really don?t have anything bad to say about it, but I would warn you to disassemble it when it rains. We didn?t do that, and rain collected in it and it collapsed, and we couldn?t put it up again. We goofed and should have taken it down. But we liked the first one so much that we?ve ordered another one just like it.